A little while ago I ordered some linen thread. I hadn't tried it before and didn't know quite what to expect. Apparently it's used for various types of embroidery such as Hardanger, pulled thread, cross stitch and even lacemaking. I wasn't planning on doing any of those techniques though, just my regular free hand embroidery stitching. The label on my thread read '3 ply natural flax wet spun'. 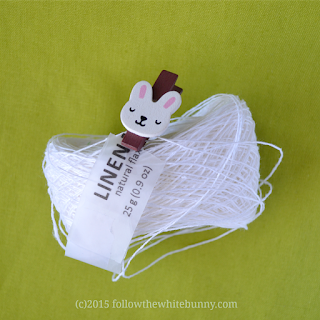 I haven't really looked into linen thread-terminology yet but I do know that there are different 'weights' of thread. As I understand it, from this site, the higher the number (50/3, 30/3, 18/3) the finer the thread. My thread didn't have an extra number but I'm pretty sure it qualifies as a sturdier variety. I also learned that the strands aren't meant to be separated and 'wet spun' makes the thread less 'hairy' (according to Nordic Needle, they sell lots of linen threads). For my first project (which is part of a new online class I'm writing) I picked dark linen fabric and a needle that was quite sharp but with an eye big enough to take the 3 ply thread. To be honest, at first it felt like I was stitching with string. 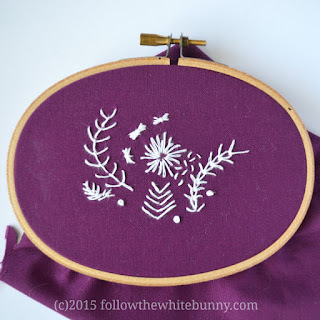 For someone who likes to fiddle with single strands of regular embroidery floss or even soft silk threads on tiny designs, stitching with linen thread was somewhat outside my comfort zone. At the same time it felt quite liberating to make bold stitches and work on a larger design! Straight stitches work well with this thread and I was even able to make some French knots. I'm not rushing out to buy lots of linen threads now, but it was an interesting exploration and it definitely adds to the rustic feel of a project!